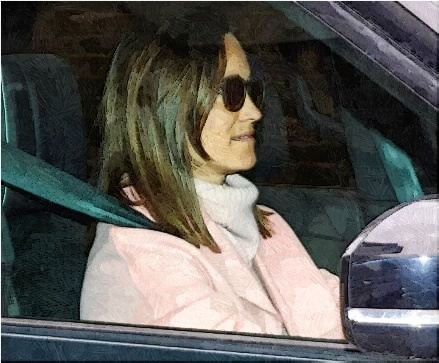 The younger sister of Duchess Kate is sporting a pink coat and an oversized pink turtleneck when she arrives at Kensington Palace to meet her new nephew on Tuesday, only one day after the prince was born. Prince Harry and his fiancee Meghan Markle are also expected to meet the new prince since they live not very far from the Duke and Duchess of Cambridge. Meanwhile, Pippa looks unhappy when she reportedly kicks out of a Tesco store. She is being asked to leave one of the supermarket chain branches in London after walking in with her two pooches. Although the brunette beauty appears to be disappointed, she politely follows the assistant’s request and leaves the place. The 34-year-old socialite is wearing a sleeveless tan-coloured outfit and trendy shades while going out with a female pal and two pets, which include her cocker spaniel, Rafa, and her husband’s black Labrador. She also recently hit the headlines as she is pregnant with her first child. A pal dished the scoop that the pregnant beauty was thrilled and utterly overjoyed.